Nothing can be more soothing and relaxing than enjoying a day on the open water and catching a few fish. However, no fishing experience is ever complete without a decent fish finder and finding the ideal one does not only come down to the features and the functionality but the quality and the affordability as well. The Lowrance HOOK-4 Sonar GPS fish finder takes a new stride in presenting a reasonably priced fish finder with high-end features. It comes packed with a GPS and multiple modes for even the most advanced angler to enjoy a simple day out on the boat. With advanced sonar sensitivity, it enables you to safely navigate through waters and never be surprised by what is around your boat and finding the ideal fishing spot can be that much easier. The Lowrance HOOK-4 features a built-in GPS with over 3000 charts of maps of US lakes, rivers, and coastlines. All of these maps have been preprogrammed and can be easily accessed with a touch of a few buttons. Upgrades are also available if you feel the need to upgrade your map library and have more locations that have not been preprogrammed. One of the first things that will come to your attention is the larger 4-inch display. It has a pixilation resolution of 480 x 272. This stands out among many of the other similarly priced fish finders with an average screen size of 3.5-inches. The LCD display is backlit and can be used in virtually any weather conditions. Should the weather make a turn for the worse, the system is waterproof with a rating of IPX7, meaning that it can withstand 1 meter of water for around 30 minutes. Additionally, a multi-screen option is incorporated, enabling the user to see three preset screens and switching between them by just enlarging the screen. CHIRP Sonar plus Downscan imaging is the latest technology to provide you with the best view possible underneath your boat. This is also used in many high-end fish finders and when combined with the transducer it provides instant results. It features 4 different frequency options to toggle between (83, 200, 455, 800 kHz) that can be toggled between to give you the display that you need. Advanced Signal Processing (ASP) is one of the features that make the fish finders easier to use. Instead of constantly adjusting the settings, it will now automatically adjust to provide clear images of the bottom. It also helps with navigation between any debris and larger objects that might be harmful to your boat. One-thumb design allows the user to toggle the menu with one thumb operating the fish finder. It includes more than 30 languages, making it versatile all over the world. Simplicity is key to the success of the Lowrance HOOK-4 and it the fact that it can be operated with one hand, allows you to keep driving your boat without being distracted. On wet and cold days, it can even be operated with gloves on, saving your hands from the blistering cold of the winters. The design is what makes this such a great option and by following all the instructions, the setup should be smooth and operating it that much easier. Once you understand the functions, the instructions can be stored away. Lowrance has definitely focused a lot on the design of the HOOK-4. It is small, compact, and lightweight. Even boasting a waterproof rating that will be great for using it in arduous weather conditions. The smaller size means that it will not take up that much space on the boat and once you are done, it can be removed and placed in your pocket when not in use to stop anyone from trying to steal it. The design and the features are definitely designed for intermediate to advanced anglers, but as a beginner, it will be a great fish finder to cut your teeth and understand how they work. With almost all the features found in high-end fish finders, this one is simple and easy to use. With 4 different frequencies to choose between, the fish finder can be used in virtually any situation. Providing a clear view in deep and shallow water. It is not only ideal for casting out a line but drop shotting is another type of fishing that you could enjoy with this fish finder. The high-resolution display makes it easy to see and spot fish and the fishing icons ensure that you never miss a fish passing by underneath the boat. Additionally, when looking at the GPS, it is one of the top GPS systems you could find in any fish finder and with the ability to set waypoints and mark favorite hotspots, you will be able to return to these fishing spots with friends later. It is also worth mentioning that the backlight will be ideal for fishing in the dark and rainy weather conditions. When fishing with your mates, versatility is something you would like when showing off your fish finder and with the multi-screen option, it is possible to preset page layouts, while using the GPS to find the exact spot you are heading towards. This makes it possible to tract the fish underneath the boat when cruising and also keeps you on your way to your destination. The Lowrance HOOK-4 is perfect for your other smaller boats and for the kayak. The quick-release bracket enables you to move it between these vessels without spending all the time mounting and dismounting it again. If you have more than one fishing vessel, this fish finder will definitely be the one to go with. The HOOK-4 is is an advanced but still entry-level fish finder that adds to the features you will find in the HOOK-3x. It is it’s far from a high-end fish finder in the Lowrance product line, but it is an affordable option with many high-end features. It is definitely a great budget option for intermediate anglers that love fishing on the lakes and shorelines. The HOOK-4 features 2 additional variations and this is the HOOK-4x and the HOOK-4 Ice Machine. The HOOK-4 Ice Machine is designed specifically for fishing in the ice and arctic conditions. With a specially designed ice transducer and sonar, it makes fishing ice fishing a little easier. This ice pack can be removed and you will have the normal HOOK-4 fish finder. The HOOK-4x is a little cheaper and this should be perfect for kayak anglers. The downside to it is that it does not have a GPS included, but all the other features of the standard HOOK-4 has been included in the package. It is a great affordable option for the occasional angler. 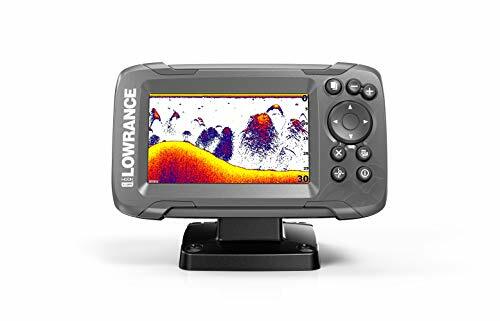 The Lowrance HOOK-4 is an extremely functional and versatile fish finder designed for intermediate anglers, but when looking at the competition in the same price level, the Raymarine Dragonfly 4PRO Sonar/GPS with US C-Map Essentials just look a little bit better in terms of the design. It is a little more expensive, but this is all backed up by great features. The Raymarine Dragonfly 4PRO Sonar/GPS features a state of the art GPS system with a larger 4.3-inch all-weather display. The backlight can be toggled on and off whenever you need it and the Wi-Fish app allows users to share their data and favorite fishing hotspots with other app users. The sonar can also be streamed directly from your smartphone, making the extra few bucks a little more affordable. The Garmin STRIKER 4cv is a little more affordable and it includes many of the same features found in the Lowrance HOOK-4. The display is a little smaller at only 3.5-inches, but it also features 4 different frequencies that can be toggled through until you find the one that best matches your needs. Mounting it is one of the simplest parts and the pixilation resolution is a massive 480 x 320 pixels. See our Garmin STRIKER 4cv review. As a beginner, the GPS is definitely not one of the main features you are looking for, but once you start moving up to intermediate angler status, the GPS is certainly something you will need to look into. The Lowrance HOOK-4 and the entire collection of variations offer a great GPS and a significant step in the right direction when compared to the basic HOOK-3x. The only change we would have liked to see is the additional upgrades being free or just a little cheaper. 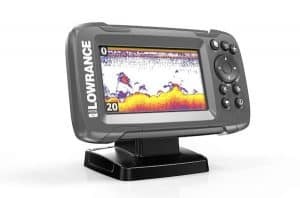 Fishing Tech will happily give the Lowrance HOOK-4 and the variations a rating of B+ and even though it is a little expensive, it is well suited for intermediate anglers and the occasion pro.